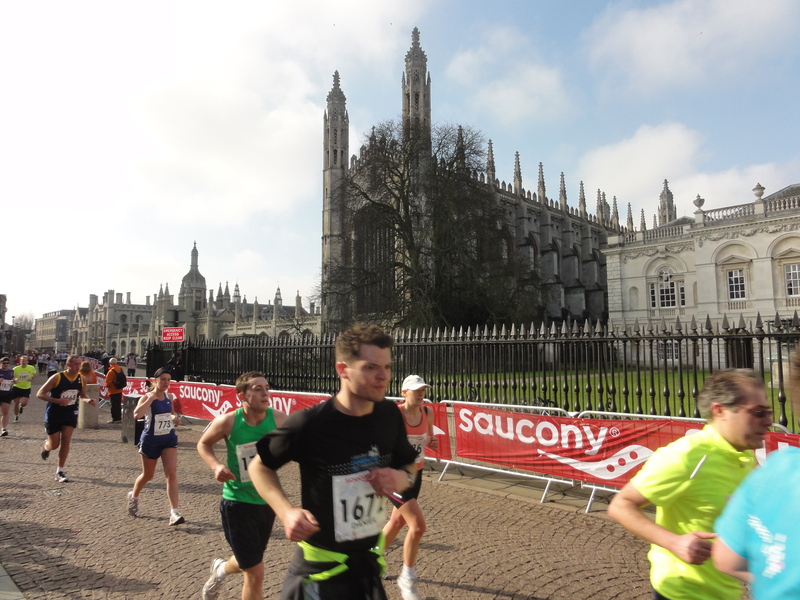 Today was the first ever Cambridge half marathon. I really enjoyed it but there are always buts! We had been advised to get there early i.e. by eight. This was an hour before the race start and I am sure that this was because there was a distinct lack of loos. We arrived nice and early using the park and ride system that was well organised with lots of buses all ready to go. We then ended up queuing for over half an hour for the toilets. There were simply not enough as people were still queuing as the race started. We were lucky and just had time to give our bags to a nice friend who was running in a relay team and get to the start. We were right at the back but didn’t worry trying to push through the crowds to get to our expected time place. This turned out to be a bit of a mistake as the first few miles was very narrow and it was hard to get into any rhythm as you had to keep slowing down and try to dodge past people. Once I very nearly fell over a bollard but managed to save myself. I was not so lucky a bit later on when I fell over a ramp (or speed bump) falling heavily onto my knees and hands. I have to say that some people were very kind and stopped to check that I was ok but I got up intent on wasting very little time! The crowd nearby were very kind as they gave a loud cheer and encouraged me as I went past. As we got into the race things did even out and I was able to get into a rhythm. The route itself was quite nice going past some of the picturesque areas of Cambridge. It was just a bit twisty and narrow in places. It is the biggest medal I have got and I am proud to have it. As for my knees, I came home and soaked them in the bath. They are both bruised and grazed. My right one is quite stiff and I am hoping that there is no real damage other than swelling and bruising. It didn’t hurt when I was running so it can’t be that bad can it? Now looking for the next one….